NICOLAS ASFOURI/AFP/Getty ImagesChina’s President Xi Jinping blows his nose during the sixth plenary session of the National People’s Congress (NPC) on March 18, 2018. Aside from being able to rule China indefinitely, President Xi Jinping is considered the “Chairman of Everything,” overseeing foreign and domestic affairs, the military, finance, and even internet security. This makes Xi vulnerable to his opponents who can blame him for almost anything that goes wrong, former Australian prime minister Kevin Rudd told US cadets at West Point earlier this month. But due also to his power over police, security and intelligence, there is little chance of this vulnerability leading to changes in China’s leadership. Chinese President Xi Jinping could be more vulnerable than ever, former Australian Prime Minister Kevin Rudd recently told US cadets. Xi, who can rule China indefinitely after presidential term limits were recently scrapped, has slowly become the “Chairman of Everything,” overseeing numerous small groups and central committees on every major area of domestic and international policy. And this could become a problem, Rudd, now the president of think tank Asia Society Policy Institute, told military cadets at the West Point academy on March 5. “What these constitutional changes have done is to make Xi potentially vulnerable to any single, large-scale adverse event in the future. If you have become, in effect, ‘Chairman of Everything,’ then it is easy for your political opponents to hold you responsible for anything and everything that could go wrong, whether you happen to be responsible for it or not,” Rudd said. Aside from being president, the head of the Communist Party, and commander-in-chief, Xi is the chairman or leader of commissions and central leading groups on national security, the military, foreign affairs, financial and economic affairs, internet security, Taiwan affairs, and all-around deepening reform. Chris Hyde/Getty ImagesFormer PM Kevin Rudd. If things go sour, politicians and citizens may only place blame on Xi because these agencies are China’s top authority on each issue. “This could include any profound miscalculation, or unintended consequence, arising from contingencies on the Korean Peninsula, Taiwan, the South China Sea, the Chinese debt crisis, or large-scale social disruption arising from unmanageable air pollution or a collapse in employment through a loss of competitiveness, large-scale automation or artificial intelligence,” Rudd said in his speech. And with drastic developments in regards to talks with North Korea and the US, and President Donald Trump spurring talk of a trade war with China, the major issues Xi oversees could be set for a major shakeup. 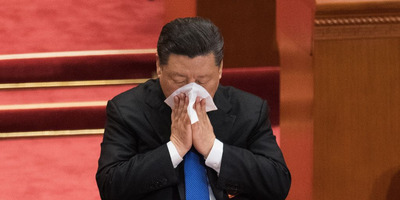 But while Xi has created himself to be a “symbolic target for any resentments” for his opponents, widespread censorship and policing combined with Xi’s command over security and intelligence are almost certain to prevent a shift in China’s leadership. “We should never forget that the Chinese Communist Party is a revolutionary party which makes no bones about the fact that it obtained power through the barrel of a gun, and will sustain power through the barrel of a gun if necessary,” he added.